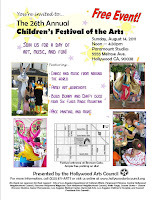 Bring your kids to the Hollywood Art Council’s 26th Annual Children’s Festival of the Arts on Sunday, August 14, from 12 p.m. to 4:30 p.m. at Paramount Pictures Studio (5555 Melrose Ave.). The celebration of the arts and culture in Hollywood will be fun for the whole family, featuring a variety of music and dance performances, kids face painting, kids art workshops, and the chance to meet Looney Tunes characters. Please enter the studio at the Bronson Gate, where there will be ample free parking on site. For more information, call 323-661-7299 or visit http://www.hollywoodartscouncil.org/.